When scrolling past an elementary slider, if the mouse is directly over the slider during the scroll, it will change the slider's value as it scrolls past it. This can easily be tested on the Scroll config page of the elementary config, as there are a large number of sliders, and the config page can scroll. Start scrolling with the mouse over the config page, but not on top of a slider. As it goes over other sliders, you should see the values change. GodGinrai raised the priority of this task from to Incoming Queue. GodGinrai added a project: Restricted Project. GodGinrai added subscribers: GodGinrai, raster. 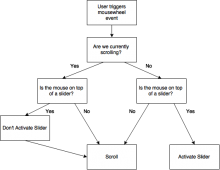 and how do you propose to fix it.. when a mouse wheel moves slider AND scrolls a scroller? drop wheel support on sliders? drop wheel support on scrollers? add an on_hold flag when wheel is used by scroller (thus it can never work on sliders inside a scroller)? I would suggest that you disallow moving the slider if a scrolling state already exists. And likewise, disallow the initiation of a scroll if the mouse is currently over a slider. that means you say mousewheel cannot work on a slider inside a scroller. you understand that right? When did I say that? I specifically said it should only be disabled if you are already in a scrolling state. Here's a flowchart that shows the decision process I am describing. This is not only a issue with slider, also with a nested scroller. and basically every widget which is reacting to wheel events. @raster what do you think about not redirecting mouse wheel events if the current scroller is currently "scolled"? 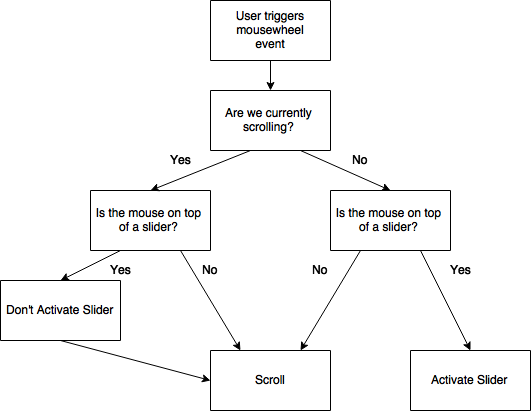 And if the current scroller is not scroller but htere is a mouse wheel event which gets consumed by a child widget, dont react to it. stefan_schmidt added subscribers: herdsman, JackDanielZ. This seems pretty trivial to resolve by adding a check to determine if a widget is in a scroller and the scroller is actively scrolling. bu5hm4n added a revision: D8456: efl_scroll: do not eat wheel events.